FamilyAsset's rankings are based on hundreds of thousands of customer reviews of nursing homes on the internet. 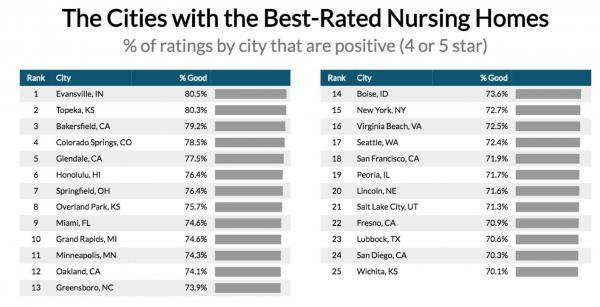 Kansas City and St. Louis have some of the worst-rated nursing homes in the country, while Topeka, Overland Park and Wichita have some of the best. 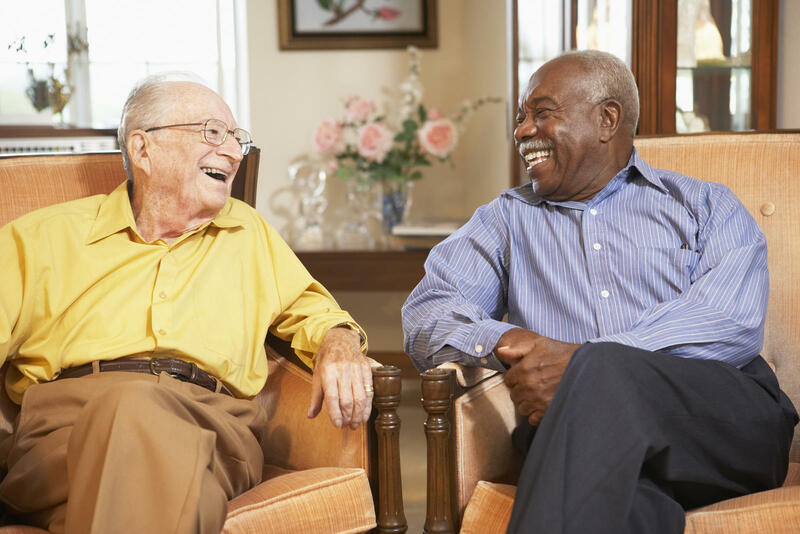 That’s according to rankings published by FamilyAssets, a New York-based company that offers assessments and planning for people seeking home health care services. The rankings are based on hundreds of thousands of customer reviews across the web, according to FamilyAssets. The company looked at the prevalence of “bad” reviews (1 or 2 stars) and “good” ones (4 or 5 stars) and ignored average ones. Kansas City was ranked the 10th worst in the country, and St. Louis was ranked 7th worst. Topeka was ranked 2nd best, Overland Park 8th best and Wichita 25th best. And among the best-ranked states, Kansas was No. 9. The cities were ranked based on their percentage of negative or positive reviews. Kansas City’s percentage of negative reviews was 45.5 percent and St. Louis’ 48 percent. By contrast, Topeka’s percentage of positive reviews was 80. 3 percent, Overland Park’s 75.7 percent and Wichita’s 70.1 percent. 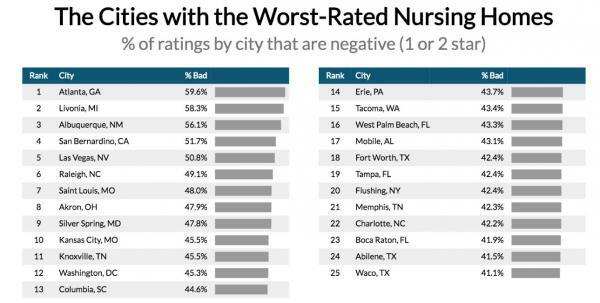 Atlanta topped the list of cities with the worst-rated nursing homes, with 59.6 percent garnering negative reviews. Evansville, Indiana, topped the list of cities with the best-rated nursing homes, edging out Topeka with 80.5 percent garnering positive reviews. Johnson was unable to account for the geographical differences. The ratings don’t entirely line up with other metrics. For one thing, Kansas took over 21 nursing homes in the past year — far and away the most it's placed in receivership in any single year — after they defaulted on payments to vendors. Fifteen of the nursing homes were owned by a New Jersey company, Skyline Healthcare, whose nursing homes have been taken over by other states as well. For another thing, data published by the investigative news organization ProPublica shows that of Kansas’ 334 nursing homes, 140 of them were cited for serious deficiencies over the past three years, meaning patients were placed in immediate jeopardy of harm. Collectively, Kansas nursing homes were assessed $7.88 million in penalties during that period. In Missouri, 60 of the state’s 519 nursing homes were cited for serious deficiencies, according to ProPublica. They were assessed $4.22 million in penalties over the past three years. 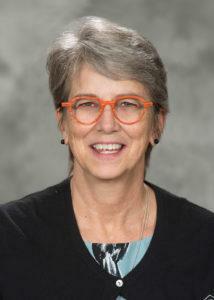 Cindy Luxem, president of the Kansas Health Care Association, the lobbying group for the state’s for-profit nursing homes, said she wasn't familiar with the FamilyAssets survey but appreciated its consumer orientation. Luxem said the heavy penalties levied against Kansas nursing homes were, in part, the product of a broken inspection system in Kansas. Luxem said some nursing homes were hit with $300,000 and $400,000 penalties, forcing at least one of them out of business. “It didn't matter whether you were a rural home or an urban home, whether you were a 50-bed home or a 250-bed home, you were getting the same kind of fines,” she said. The government publishes its own ratings of nursing homes. The Centers for Medicare and Medicaid Services (CMS) in 1998 launched its Nursing Home Compare website, which relies to a great extent on self-reported data. Nursing Home Compare uses a five-star quality rating system, with one star being the lowest possible score and five the highest. The ratings are based on a variety of factors, including health inspection reports, quality of care measures and overall staffing. Johnson said FamilyAssets did not check to see how its rankings aligned with those of CMS, although he said the company might do so in the future.